Aprendiendo por qué los anestésicos son tan potentes y algunas veces peligrosos nos llevará a buscar, descubrir y sintetizar una nueva generación de fármacos más seguros sin efectos indeseables o secundarios. A <?xml:namespace prefix = st1 ns = "urn:schemas-microsoft-com:office:smarttags" />Hollywood thriller due out this year centers on a young man who awakens while undergoing open-heart surgery but is unable to move or cry out. The film’s plot will undoubtedly take many more dramatic turns from there, but its early premise is, sadly, not entirely far-fetched. Episodes of intraoperative awareness while under general anesthesia are reported by one or two of every 1,000 patients. In reality, such incidents are usually brief and generally do not involve pain or distress, but they do highlight one of several ways that even the newest generation of anesthetic drugs can sometimes leave much to be desired. Indeed, the medical specialty of anesthesiology has evolved into a sophisticated art form because scientific understanding of how anesthetic drugs actually work, and how to make them better, has lagged behind most other areas of drug development. Many of the modern anesthetics, in fact, share structural properties and clinical effects with ether, whose application as an anesthetic was first successfully demonstrated in public by Boston dentist William Morton in 1846. 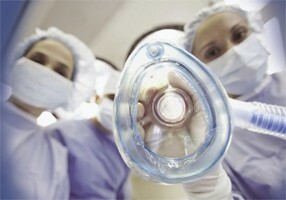 Since then, the use of general anesthesia has expanded to 40 million patients each year in North America alone. Yet advances in anesthetic care since Morton’s day have come largely from the development of complex drug delivery systems and strategies for managing anesthesia’s dangers and side effects.